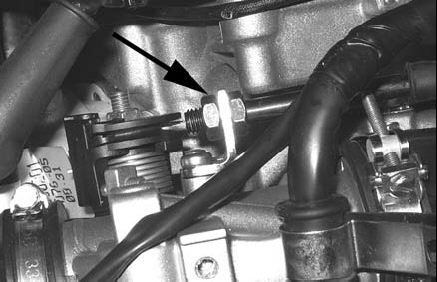 This article details a procedure for adjusting the throttle cable free-play on a GT250ie. Although this article is written for the GTS250ie, the subject matter is applicable to all modern Vespas. The ET2/4, LX50/150 and GT200 have a similar adjustment, at their carburetor. The throttle will have the most free-play when the handlebars are in the neutral position, where the front wheel is centered. The throttle will have the least free-play when the handlebars are completely cocked to the side, with the front wheel at the full-left, and full-right, positions. It's necessary to maintain some free-play in the throttle cable, to prevent accidental throttle application. It is important to maintain some free-play at the full-left and full-right positions. Do not completely take-up all the throttle free-play. If you feel your throttle free-play is excessive at both the full-left and full-right front wheel positions, you can take-up the excess cable slack at the throttle cable adjuster. Thanks to Marc for the initial posting, Buzz for the procedure, Piaggio for the pictorial, and Gary for the preface. One of the things that bugged me about my new GTS was the 'slop' in the throttle before anything happened. I found I was jamming on the gas to get things moving because there was a good 3/4" of play before the throttle began to move. This was confirmed by Chris at the Temecula wine ride who had adjusted his. We went around the assembled GTS's in Matt's drive checking for play. All had it to lesser and more degrees, mine wasn't so bad compared to some. There is a tube that mounts to the throttle body that the cable goes through. There is a lock nut either side of the mounting bracket. I undid these nuts (12mm open wrench) and wound the tube away from the cam that the cable attaches to on the throttle body by tightening the nut to the rear of the bracket, simultaneously loosening the nut on the cam side. A couple winds, check the play, a couple more winds, check the play, being aware that you are not beginning to 'pull' the cam and cause fast idling. What a difference. I find I am only using a half inch of throttle now, compared to really twisting it before. Although there is no performance gain as such, I believe it has greatly improved the rideability of the scoot and I'm betting that my mileage is going to increase as a result of not being so heavy handed to get her going. All in all it took me a very careful 15 minutes. I could not find a free play spec in the GTS repair book. I'd agree that it should be around 2-4 mm, say 1/8 to 1/4 of an inch. This photo from the GTS repair manual shows the two adjusting nuts a little more clearly. The throttle cable can be seen sticking out of the end of the threaded guide tube, to the left of the arrow in the photo. The front of the scooter is to the left. Loosen the left nut (the one the arrow points to) almost all the way so it's backed away from the L-shaped bracket. Then rotate the tube/nut assembly on the right, which will pick up slack in the cable. When the cable is where you want it, make sure the tube/nut assembly is against the L- shaped bracket and then finger-tighten the nut on the left. Now check your free play. If it's where you want it tighten the two nuts together firmly with the L shaped bracket in between them, as seen in the photo. Make sure that you tighten them together well. I thought mine were tight and they came loose when I was test riding with the new setting. Doh! Be patient, this is a little harder than it looks because of the limited space in this area, and the fact that there's not a lot of room to get a wrench over the left nut to tighten it back up when you're done. For best results, use two small open end wrenches of the correct size. The first time I did it, I only had one and tried to use an adjustable wrench for the other and it was difficult.